Mikro Air Jet Sieve, Particle Size Analyzing Machine - Gilson Co. The Mikro Air Jet Sieve™ is an accurate and reliable single-sieve system for 10 to 100g samples of dry powders from No. 4 to No. 635 (4.75mm to 20μm). Operation is clean and quiet. A rotating slotted nozzle supplies positive air pressure to gently fluidize the sample in a covered test sieve. Exiting air is drawn downward with an external vacuum system, creating a negative pressure to carry undersize particles to a collection canister. Air Jet sieving action is gentle, effective, and especially useful for fragile or low specific gravity materials. Test times and vacuum/pressure settings are controlled through the integrated computer, with capacitive touch screen controls and display. 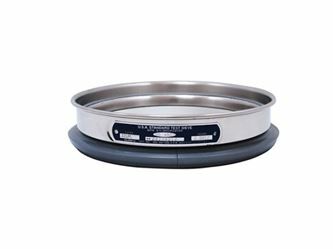 Basic or Advanced versions are offered, each with separate models configured for use with ISO 200mm and older style Air Jet Test Sieves, or with ASTM 8in (203mm) diameter Test Sieves. Contact Customer Service for parts to adapt either model to use alternate sieve sizes. Made in the U.S.A.
AJ-103 Basic Mikro Air Jet Sieve™ is suitable for specific micron size evaluation. It consists of the base unit with a clear acrylic sieve cover, slotted brass air nozzle, electronic controls and integrated computer and touch screen display. The 15-Watt bevel-gear motor has lifetime lubricated bearings. The cast aluminum instrument housing features a built-in pressure differential gauge and has a baked enamel finish. An integral electrical outlet provides a convenient connection for the vacuum system, which is purchased separately. Vacuum is monitored at the housing outlet and has a control valve for adjustment. 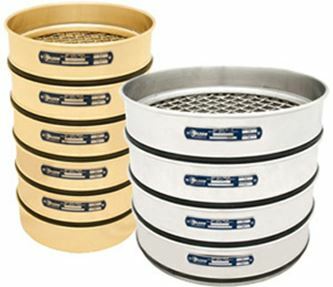 AJ-103 accepts 200mm ISO Test Sieves or old-style Air Jet Test Sieves. AJ-103B model is configured for ASTM E11 8in (203mm) diameter Test Sieves. AJ-105 Advanced Mikro Air Jet Sieve™ consists of the Basic model with advanced menu-driven software. The software collects and calculates particle sizes from a number of test sieve screens then generates a distribution. The advanced model can connect to a compatible printer via USB, WiFi or CAT 5 cable and a compatible balance via a RS-232 connection. Additional advanced model functionality includes comparative overlay of analyses and USB data backup. This model can be ordered directly or by purchasing a simple AJ-111 Advanced Software Upgrade to unlock these features on an existing Basic unit. AJ-105 accepts 200mm ISO Test Sieves or old-style Air Jet Test Sieves. AJ-105B model is configured for ASTM E11 8in (203mm) diameter Test Sieves. The AJ-105 models or upgrades require an AJA-135 Electronic Balance, purchased separately. The Balance has a capacity of 4,200g with a readability of 0.01g, and is supplied with an interface cable. A vacuum system is required for operation and purchased separately. The AJA-134 Vacuum System is recommended for best performance over a wide range of materials, including very fine and conductive specimens. AJA-133 Standard Vacuum System has a low-noise 1,000-Watt motor and low-profile epoxy-lined steel filter canister with 4gal (15L) capacity. Note that the Standard Vacuum System is not designed for conductive materials or materials with high fines content. The AJA-4 Cyclone Collector, used in conjunction with the vacuum systems, assures greatest recovery of sub-micron fines.